Innovating in diabetes is hard. Raising capital to innovate in diabetes is hard. The Bigfoot mission is personal, and it provides Brewer with the fuel to keep going. Bigfoot was born out of personal experience—Jeffrey’s son has Type 1 diabetes—and there are no current solutions for managing insulin delivery: just technology pieces. The Bigfoot mission, then, is not just a cutely crafted statement hanging on the office wall, it’s critical to the company’s success, and Brewer refers to it frequently in our conversation. Turns out, innovating in diabetes is hard. Raising capital to innovate in diabetes is hard. The Bigfoot mission is personal, and it provides Brewer with the fuel to keep going. Bigfoot is designing the experience for patients, for providers, and for payers. The solution needs to be comprehensive, and it needs to address all three of these constituencies at the same time to be successful. Bigfoot is betting its future on a new business model. If Bigfoot can’t save payers money by reducing patient hospitalizations, it will fail. Incumbents can’t afford to expose themselves to such risk. Enter Bigfoot. Bigfoot is focused on execution. Execution, not technology, not regulatory, not business model, is its biggest risk. And because capital in diabetes is hard to raise, and much of the technology exists already, Bigfoot is partnering where it can, and only developing new stuff where it is really needed. People living with diabetes who dose insulin can struggle to control their glucose. “[Insulin] is a dangerous drug. The tools that are required to deliver it are complicated. [They] require a lot of training, a lot of discipline, a lot of work.” More than this: “They are only effectively used by the best patients, with the best insurance, and the best doctors, and that’s just not your average person.” For patients, ease-of-use is paramount, but the right solution must also manage disposables inventory and require one scrip and one copay. “They don’t want to spend more time on their disease, they want to spend less,” Brewer says. The average patient “doesn’t read manuals, doesn’t listen to their doctor, doesn’t follow instructions.” He wants to make “easier to use” part of the label. Finally, payers don’t believe existing tools will deliver an economic outcome. Addressing the needs of payers is about identifying the right business model, one that’s based on what payers care about, one that can be measured, and one that delivers returns over the short-term. The acquisition of Asante, early on and for a relative bargain, was an important accelerator for Bigfoot, as is the signing of agreements with private payers. Brewer is focused on execution. This is his biggest concern. Bigfoot needs to own the pump since it must embed intelligence, connectivity, and security into its system for it to deliver on its value proposition. Elsewhere, it is looking to partner. 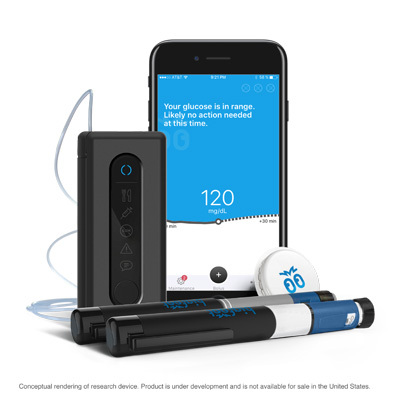 Abbott is its choice for continuous glucose sensing, and Ypsomed for linesets. Ultimately, Bigfoot is an integrator driven by forward progress and capital efficiency. It doesn’t want to build anything that already exists.